Esker is a shared document process automation platform designed to reduce paperwork and automate mundane tasks in corporate environments. The platform brings under the same roof powerful document delivery, accounts payable & receivable, purchasing & fulfillment, and order processing automation, enabling companies to save time and resources while delivering the best customer service possible. In detail, what Esker does is to transfer business information exchange and processing in a collaborative cloud environment, and cover virtually any document-related process in need of agile methodology. The scale or industry of the business won’t matter – the solution is global, and yet deployed and supported locally to meet the needs of all customers. As your valuable data partner, Esker will pull off and analyze all critical metrics, and make information accessible to all employees and business partners. Once data is organized and displayed on the dashboard, it becomes visible to all interested parties, which enables instant reaction to prevent problems or use valuable opportunities. What will Esker automate? The suite offers procure-to-pay process flow solutions to optimize ordering and spend requests, and transfer online purchase requisition and order forms to the cloud for standardized approval. For the purpose, the correct level of authorization is applied to all requests, and spend is agreed in line with budget merits. The user once again gets to work with the desired suppliers, so that purchases are never outside the company’s policy, and is completely empowered to complete all operations from his mobile device. At the same time, Esker streamlines your order management processes by preparing a catalog of approved items for a specified timeframe, and directing those towards interested buyers. From his perspective, this means immediate feedback on whether the order is received and approved, and detailed information on how it will be executed. This, combined with the smooth interface and professional looks of the system, gives your service credibility even without discounts and special conditions. Nevertheless, with pre-approved purchase orders (POs) you’re enabled to offer such (including early payment deductions) to keep buyers and suppliers happy. 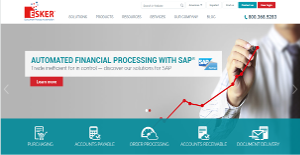 As for accounts payable and accounts receivable, users can rely on the fact that Esker accelerates invoice processing, delivers start-to-end visibility, and makes the workflow ERP-independent. What the company is particularly proud of is the ‘touchless invoicing’ where minimal intervention is required to process both small and multinational invoices in over 120 languages. Document delivery is also brought to perfection, with FlyDoc (online mail & cloud fax service), integrations with all leading email service providers, fax servers for routing and archiving paper information, and a dedicated cloud fax service enabling the user to receive/send fax 24/7, and with bulletproof security. To make matters even better, Esker guarantees efficient cash flow management for its customers, and helps them regain control over their processes to prevent fraud. Same counts for budget, where users get an effective follow up despite of the fact that financial closing is significantly accelerated. Esker is also very flexible and easy to use, which is why even beginners won’t have issues working with it. If you are interested in Esker it might also be beneficial to examine other subcategories of Best Business Process Management Software listed in our base of B2B software reviews. Every business is different, and may require a special Business Process Management Software solution that will be fit for their business size, type of customers and staff and even specific niche they cater to. You should not count on finding a perfect app that will be suitable for every company regardless of their history is. It may be a good idea to read a few Esker reviews first and even then you should keep in mind what the software is supposed to do for your business and your workers. Do you need a simple and intuitive app with only elementary functions? Will you really make use of the complex tools needed by pros and large enterprises? Are there any specific tools that are especially useful for the industry you operate in? If you ask yourself these questions it will be much easier to locate a trustworthy service that will match your budget. How Much Does Esker Cost? We realize that when you make a decision to buy Business Process Management Software it’s important not only to see how experts evaluate it in their reviews, but also to find out if the real people and companies that buy it are actually satisfied with the product. That’s why we’ve created our behavior-based Customer Satisfaction Algorithm™ that gathers customer reviews, comments and Esker reviews across a wide range of social media sites. The data is then presented in an easy to digest form showing how many people had positive and negative experience with Esker. With that information at hand you should be equipped to make an informed buying decision that you won’t regret. What are Esker pricing details? What integrations are available for Esker? If you need more information about Esker or you simply have a question let us know what you need and we’ll forward your request directly to the vendor.